Sales from organic farms have more than tripled in Illinois in recent years, and local business owners say more Quad Citians are looking to eat fresh, too. At Moline’s Barley and Rye Bistro, owner and chef Jared Linn works with more than 30 area farmers, using their meats, cheeses, grains and produce in his dishes. “Anymore, people want to know what’s in their food. They don’t like going to the grocery store and reading the back of a can and seeing 95 ingredients… and not knowing what 93 of them are,” said Linn. Linn also tries to use as many organic farmers as possible, even making breads with organic flour and growing organic herbs on the patio. “It’s not sprayed down with chemicals; you know what you’re eating. It’s just straight from the land,” said Linn. That farm-to-table movement is just part of the reason that sales from organic farms in Illinois more than tripled from 2007 to 2012. 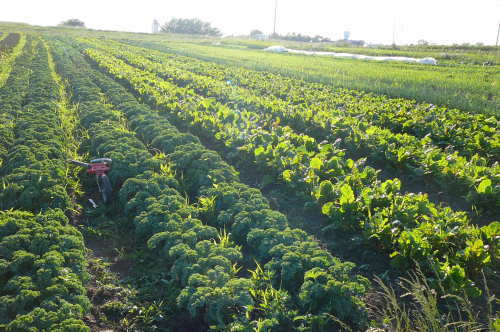 According to the latest U.S. Department of Agriculture census released this week, organic growers in Illinois accounted for $26.2 million in sales in 2012. That number is up from $8.3 million in statewide sales in 2007. At Let Us Farm in Geneseo, Illinois, Randy and Lee Hoovey say they’ve seen the popularity of organic growing take off in recent years. “It’s still a small segment of farming right now, but it’s growing by leaps and bounds,” said Randy. Read the full story via Sales from organic farms spike in Illinois | WQAD.com.